The vast majority of paintings produced throughout the 16th and 17th centuries in Spain were religious. As the wealthiest institutions in the country, the Catholic Church and its related monasteries, convents, and abbeys commissioned a huge number of paintings to fill the many buildings they owned. Also, in 1492, the defeat of Kingdom of Granada (the last remnant of Muslim al-Andalus), and the fortuitous discovery of America in the same year, ensured that there were endless demands for paintings for years to come. The importance of paintings (and sculpture) to reinforce religious messages had always been recognised by the Catholic Church. They offered the predominantly illiterate faithful a visual aid to the Bible, exalting Christ, the Virgin Mary and the saints, or eliciting an emotional response to the suffering of Christian martyrs. Although there were hundreds of Spanish-born painters in Spain during the Golden Age, they were largely overlooked in the 16th in favour of foreign-born artists, the vast majority of whom were from Flanders and Italy. Commercial traffic between Spain and Flanders and scholarly and religious exchanges between Spain and Italy ensured that Spain was up to date with events in both countries. Artists from these countries were sought not only by the Catholic Church, but also by royalty, nobility and wealthy individuals (e. g. merchants) because they were at the cutting edge of new painting techniques and enjoyed widespread prestige and fame. Charles V, painted by Titian, 1548, following the Battle of Muhlberg, 1547. A public image of the imperial, triumphant, warrior king. Complementing Spain’s commercial, scholarly and religious contacts with Flanders and Italy was the political power wielded by Spain following accession to the Spanish throne in 1516 of the Hapsburg prince Charles (grandson of the of Catholic Monarchs, Ferdinand and Isabella). Born in Ghent, Flanders, Charles I (of Spain) inherited large chunks of Hapsburg territory in Western Europe which became part of the Spanish empire. 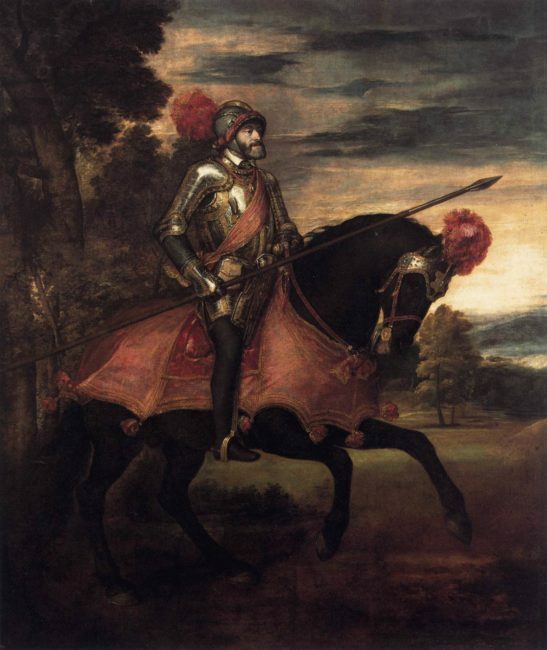 Equally important, in 1519 Charles was elected Holy Roman Emperor (therefore Charles V of the HRE), a title which shouldered him with the duty of defending the papacy and the interests of the Catholic Church. The need to defend the Catholic Church became especially acute during Charles’s reign. There had been rumblings of discontent for a while in northern Europe over corruption in the Church. These criticisms were inspired initially by reformers within the Catholic Church, the most famous being Martin Luther. In 1517, Luther published his famous 95 propositions in Latin attacking church corruption, especially the abusive use of indulgences. In 1521, he was excommunicated by the pope and condemned as an outlaw by Charles. Events moved quickly as more protestors joined in opposition to church corruption. Protestantism was born! The rise of Protestantism had implications, both political and religious. Politically, it threatened to break up Spain’s control over much of Europe. Religiously it jeopardized the Catholic Church’s unity throughout the continent with its emphasis on simplicity, a personal relationship with God (i. e. eliminating priests as mediators/intercessors), and in extreme cases, rejection of painting (and sculpture) as idolatrous. In the second half of the 16th century, Spain under the pious Philip II closed in upon itself to protect its Catholic spirit, and viewed new ideas beyond its borders with suspicion. Religiosity increased, censorship was strengthened and the infamous Inquisition flourished, publishing its first index of prohibited books in 1551 and much longer lists in 1559 and 1583. Secular texts were published a lo divino (e. g. pastoral and romances of chivalry were converted into religious texts), mystical works emerged (e. g. the poems of San Juan de la Cruz -St. John of the Cross) and devotional texts and religious treatises proliferated. Where does art fit into all this? The Council of Trent (1545-63). As protestant reformers gained ground in northern Europe, art became a vital tool in Catholicism’s battle with Protestantism for the soul of believers. Painting’s role was articulated in the Catholic Church’s response to the Protestant threat at the Council of Trent (a series of meeting of Catholic theologians in the Italian town of Trent between 1545 and 1563). Painters were urged to encourage piety by drawing on biblical topics that would awaken compassion, especially the Immaculate Conception, the Madonna and Child, Christ’s Passion (from the Garden of Gethsemane to the crucifixion) and the Pietà (Mary cradling the dead Jesus below the Cross). Saints and martyrs were also worthy subjects. Artists were urged to eliminate unnecessary or irrelevant ornamentation and focus on clarity or simplicity of expression or austerity regarding the subject matter. They were especially recommended to render their paintings as direct, compelling and as relevant as possible to ordinary people through a straightforward didactic narrative (emphasis added). The Council’s call was generally answered, although there were still plenty of canvases filled with puttis (from the Italian putto: a male child, frequently naked and chubby), angelic hosts and extravagant, theatrical ornamentation, especially in larger canvases. Probably the best-known Spanish painter whose work might well be considered full of ornamentation and lacking in relevance to ordinary people is El Greco (ca. 1541-1614). His elongated, unearthly figures reaching heavenwards in swirling clouds etc. evoked mysticism which the Catholic Church frowned upon. Mysticism, by describing the joys of direct communion between believer and God, suggested Protestantism and Protestantism was a challenge to Catholicism’s monopoly over the spiritual welfare of Christians. El Greco, however, was a “one off” and his originality, strong personality and status in Toledo ensured a steady clientele for his paintings despite having a painting rejected by Philip II. One response to the Church’s directives was to continue the practice of focusing on simple compositions of, for example, Mary and Child or the Pietà. Luis de Morales (c. 1509-86), who worked primarily in and around Badajoz (Extremadura), specialized in small devotional paintings. One of his best-known works is the Nursing Virgin (ca.1565), a tender moment with a child gazing at his mother while with one hand he searches for her breast and with the other clutches her veil; for her part, his mother’s prominent hands cradle him with protective gentleness. All external distractions have been eliminated as the Virgin and Child blend into the dark background thanks to a masterly combination of sfumato and chiaroscuro (the technique of dark background to highlight an individual was already widely used in portraits). As a result, Morales leaves worshippers to meditate exclusively on the intimate, natural relationship between mother and child. It is simple, direct, compelling. Nevertheless, the Nursing Virgin belongs to a well-established Italian Renaissance tradition with a serene, idealized Mary and chubby Child Jesus. A more suitable response to the Catholic Church’s promotion of relevance and the elimination of irrelevant ornamentation came in the late 1500s with the emergence of naturalism in Italy. On the one hand, naturalism arose in reaction to the exaggerated and distorted forms etc. 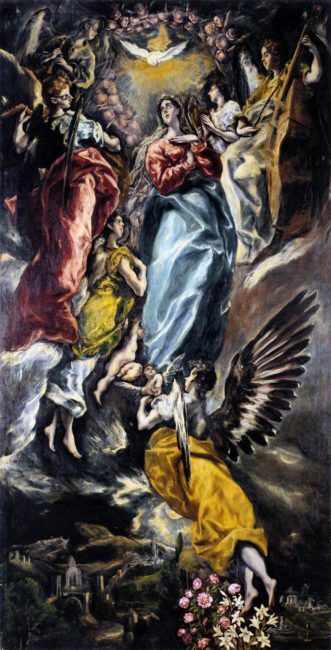 of mannerism (of which El Greco was the best-known exponent in Spain) and on the other it coincided with a desire to return to a study of real life as opposed to the idealism and classicism of the Italian Renaissance. As had been the case throughout the 16th century, constant movement between Spain, Italy and Flanders ensured that the latest artistic trends would be quickly absorbed or adapted by Spanish painters. By the end of the 16th century, direct observation of contemporary life was increasingly adapted to religious works as a means of reaching everyday worshippers. Ordinary individuals dressed in contemporary clothes to portray biblical figures also made them more accessible to everyday worshippers. In that way, depictions of the Holy Family, the adoration of the shepherds, the magi, or saints etc. became more relevant. Biblical figures or saints painted in everyday 16th-17th-century clothes looked very much like everyday people. Valdes Leal. 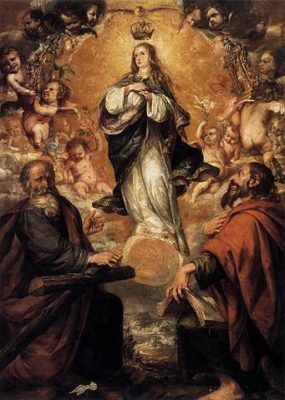 Virgin of the Immaculate Conception. Nevertheless, the increased attention to realistic paintings does not mean the elimination of those extravagant excesses that the Council of Trent had considered a distraction and therefore irrelevant. Indeed, Italian-style decorative paintings, continued well into the 17th century. For example, as late as 1650, Juan de Valdés Leal’s Virgin of the Immaculate Conception with St. Andrew and John the Baptist (1650-52) with its Italian style fantasy had little direct relevance for ordinary people. 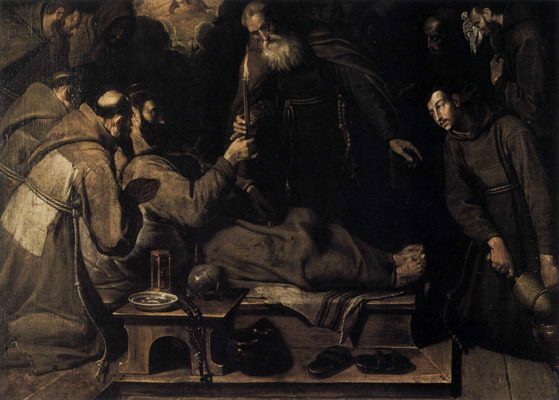 On the other hand, the Death of St Francis (1593, 115 x 153cm, in the Museu Nacional de Arte Antiga, Lisbon) by the Italian-born Bartolomé Carducho** is a fine rendering of the new realistic approach. **Born Bartolommeo Carducci in Florence ca 1560, he moved to Spain in 1585 becoming royal painter to Philip II in 1598. He died in Madrid in 1608. Bartolomé Carducho. Death of St. Francis. 1593. Churchgoers, seeing the Franciscan monks, would immediately recognize them from their rough habits/ robes and empathise with their grief. The gestures of the monks in prayer or weeping (the monk upper right corner) arouse compassion. The dying saint’s habit is threadbare and his bare feet are dirty. On the raised floor beside him are his discarded sandals next to a chamber pot. Nothing could be more down to earth. On the bench are his rosary, a bowl of thin soup, an hour glass and a human skull. It is a touching, solemn moment with an authentic feel that allows the viewer to meditate on the human drama that is taking place. But the hour glass and the skull are also a reminder to viewers of the fragility of life and the fate of all people. The use of chiaroscuro –the interplay of light and shadow— is especially effective in the Death…, where muted light, crossing from the left, is absorbed into the robes of the monks and the saint, thereby giving added depth and realism to the scene.To the right, faint figures blend into the shadows, and only the faces of the young monk to the right and the Moses-like figure in the middle are illuminated by the candle being gently passed to St. Francis. In literature, for example, pícaros (rogues) like Guzmán de Alfarache, and common people –living in the “here and now”—replaced knights-errant or shepherds lamenting unrequited love. Nobles rubbed shoulders with peasants and were often shown to be no better morally, and classical gods and goddesses were shown to be no more than mortals in disguise, subject to the same weaknesses as humans.